Ailing Algerian President Abdelaziz Bouteflika, who rarely appears in public, received Russian Prime Minister Dmitry Medvedev on Tuesday, the APS news agency reported. Russian and Algerian state media published pictures of the meeting, which was closed to other news outlets. Bouteflika, who is 80 and has held office since 1999, suffered a mini-stroke in 2013 that affected his speech and mobility. He has since used a wheelchair and is occasionally featured in state media receiving foreign dignitaries. In September, Venezuelan President Nicolas Maduro paid a 24-hour visit to Algeria without officially meeting Bouteflika, despite intense speculation that he would do so. 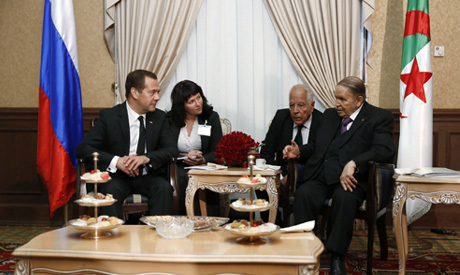 Before Medvedev, the last senior foreign visitor officially received by Bouteflika was his Congolese counterpart Denis Sassou Nguesso, on March 28 in Algiers. Critics have questioned Bouteflika's ability to govern since his stroke, but the president's inner circle has insisted he has fully exercised his powers.